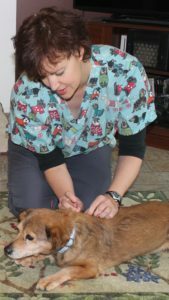 Dr. Karen Louis is certified in Scientific Veterinary Medical Acupuncture! This is different from Traditional Chinese Medicine. I’ve known that acupuncture is effective, and have wanted to learn it for years. I am a scientist at heart. (Before deciding to go to vet school, I was a molecular cell biologist.) Wanting to add acupuncture as another way to help animals, I read the textbook and took a day-long class on Traditional Chinese Medicine Acupuncture for veterinarians. I learned about Qi (pronounced Chee), and how a dry Liver or a damp Spleen can be the cause of disease. I learned that Qi can be stagnant, or Yin can be deficient, and these cause symptoms. Yet, I just could not accept these metaphors. Qi just wasn’t something I could wrap my head around and believe in. So I left the Wind, the Wood, and the Qi behind. That style of medicine works great for many people, but I am not one of them. Yes, I wanted to offer acupuncture, but from a medical standpoint. I trained at Curacore, formerly associated with Colorado State University, and found exactly what I had been seeking. This style of acupuncture is unique because it is science based. The director for this course (both a human physician and veterinarian) spent years researching the neurologic basis of acupuncture, and deciphering what makes the points do what they do, from a physiologic perspective. We select points based on our diagnosis, using modern medicine, and treat the nerves and systems involved. No Qi, no Fire. Here’s some common questions and answers about scientific acupuncture for dogs and cats. What does acupuncture actually do if you aren’t moving Qi? 1 – Blood flow to an area can be increased. This helps deliver oxygen and medications to the site, as well as aid in the removal of metabolic waste. 2 – The body is stimulated to release its own natural chemicals that are beneficial, including pain relievers and endorphins, as well as anti-inflammatory substances. 3 – Placing a needle into a knotted or tight muscle can help it relax, further reducing pain and symptoms. 4 – Most importantly, acupuncture needles communicate with the nervous system, a process called neuromodulation. What is neuromodulation and why do I care? With many disease processes, the sympathetic nervous system can be over-stimulated. Remember high school biology, and how your sympathetic nervous system is responsible for “fight or flight.” Chronic pain, or diseases like kidney or liver failure, can result in this system consistently being over-active. The body knows something is wrong and wants to help, but is going about it all wrong. So by communicating with nerve endings at acupuncture points, we can tell certain aspects of the nervous system to calm down. Reducing the sympathetic overdrive can reduce symptoms of disease. We’re helping the body return to baseline, or neutral. Conversely, if a nerve is not functioning, like in a dog that can’t use its back legs, we can use acupuncture to wake these nerves up. This time we are stimulating nerves, with the goal of going back to a healthy, normal, balanced level. So the term neuromodulation means telling the nervous system to return to its normal, default state. Think of it as restoring the factory settings, in a way. Opening a sterile acupuncture needle sounds a lot like a food wrapper. Many dogs are very interested! So how do you actually do this to dogs and cats? 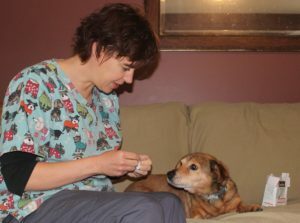 I provide acupuncture to dogs and cats in their homes. The animal does need to lie still for about 5-20 minutes, so not all patients are realistic candidates. I use food bribery a lot, but I’ve learned these treatments only work if the owner is involved as well. Acupuncture is not about being restrained, but being relaxed. 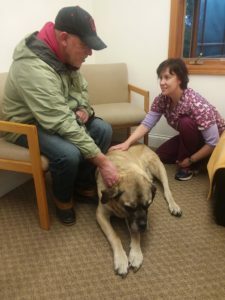 I often will not have a technician with me on these appointments – I want the owner, whom the pet trusts the most, to be there to help keep him or her calm. An animal that needs to be forcefully restrained is not a realistic candidate for acupuncture. That said, the first visit I go easy on them. I do simple points that don’t involve the feet (most animals resent having their feet touched!). I start with general relaxation points, and avoiding getting into the painful regions the first time. I want us to stay friends. As the pet gets used to treatments, I incorporate more points, possibly even mild electrical stimulation, depending on the disease process. Our focus is always the comfort of the pet. When she’s done, I’m done! Do animals really tolerate needles? Surprisingly, most do! Acupuncture needles are incredibly thin, some the diameter of a hair. I buy two different brands that manufacture needles with very refined points for painless insertion. How often should veterinary medical acupuncture be performed? That depends on the disease. Dogs who are paralyzed will need daily treatments. Dogs or cats in pain can start 1-3 times a week, and taper to monthly acupuncture treatments. Preventative acupuncture, such as dogs prone to arthritis or disc disease, but not yet showing symptoms, can be every 1-2 months. There are no hard and fast rules, and much depends on the condition of the individual pet and what the owner is willing to do. I have many patients I see every 1-2 weeks doing great! Nothing is 100% risk free. (By simply driving to your house I am putting myself at risk of a car accident!) In reality, the chances of side effects and complications from acupuncture are minimal. Some animals may feel tired the rest of the day after a treatment. Is it from the acupuncture or the excitement of the visit? Or both? We really don’t know. Some acupuncture points may cause initial discomfort. If the dog or cat does not tolerate a certain point, I simply remove the needle – problem solved. Can acupuncture cure my pet’s cancer? I would love to tell you yes, but the truth is no. Acupuncture is great, but it is not magic. That said, I have many cancer patients that I treat with acupuncture. Cancer pain is a completely different process than other pain, such as an injury or arthritis. It therefore must be treated differently, and acupuncture helps. Also, pets who are undergoing chemotherapy or radiation can benefit from acupuncture, as it can reduce the side effects of these treatments. You say it’s scientific acupuncture – tell me the science of how it works! At the risk of over simplification, acupuncture works through the network of nerves in our bodies. Messages from a needle in the hand or foot can travel up the spine and communicate with other nerves in the brainstem. For the details of it all, visit my Acupuncture and Science page! How do I know if my dog or cat will benefit from acupuncture? Acupuncture can provide a variety of benefits. Yes, we think of nerve problems and pain relief as the big ones, but digestive disorders, urinary disorders, and even respiratory disease can be treated. Email me at DrLouis@MEHVC.com and I can answer any questions you have. My phone number for acupuncture questions and appointments is 314-690-1VET (314-690-1838). You may call or text this number.